Suntex Marina Investors LLC, an owner and operator of marina properties, announced that it has entered into an agreement with, and acquired certain interests of, Marina Jack Holdings, LLC and affiliates of SRS Holdings, LLC. These companies are the parent companies of Marina Jack and Oleary’s Tiki Bar in downtown Sarasota; as well as Bayfront Yacht Works & Marina, Bayfront Excursions, and Turtle Beach Grill on south Siesta Key, Florida. All employees and management personnel of Marina Jack’s restaurant and marina subsidiaries will be kept throughout the transition. “This is without question a merger of strengths from an operational and managerial standpoint,” said Robert L. Soran, CEO of Marina Jack. “We share a vision of future growth opportunities for our people and our combined companies.” Soran will have an equity interest and board advisory capacity with Suntex. The Suntex merger includes two local marina entities. With direct, no-bridge access to the Gulf, Marina Jack’s marina operations is an iconic marina-based hospitality center located in the heart of town. The marina features slip accommodations for vessels up to 228 feet, with 316 wet and dry slips, a full-service fuel dock, ship’s store and an on-site Yacht Services department. The same management and operations personnel who developed Marina Jack into an award-winning marina recently purchased the former Turtle Beach Marina in September 2015. Now known as Bayfront Yacht Works & Marina, this south Siesta Key business features a full-service boat yard with haul-out capabilities for vessels up to 65 feet. Bayfront Yacht Works & Marina adds an additional 60 dry and wet slips to the portfolio, along with a rapidly growing boat and watersport rental business known as Bayfront Excursions. The merger also includes three well-known restaurant entities. 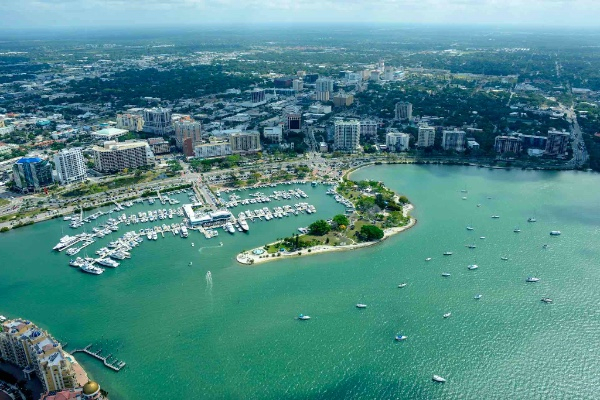 As Sarasota’s oldest continuously operating restaurant, Marina Jack is comprised of three dynamic hospitality venues featuring a mix of casual and upscale dining. Marina Jack offers a full-service private event room popularly used for weddings and group events with unparalleled views of Sarasota Bay. The restaurant also operates the Marina Jack II, a 96-foot passenger vessel known for Sarasota’s best sightseeing and sunset dinner cruises. Oleary’s Tiki Bar & Grill, located adjacent to Marina Jack along the Sarasota Bayfront, is the area’s only “Key West” themed restaurant. This casual tiki bar backdrop features live entertainment daily and a dining area directly on the beach. Furthermore, Marina Jack’s management and ownership team acquired Turtle Beach Grill on south Siesta Key in September 2015. With indoor and outdoor seating just steps away from Siesta Key’s Turtle Beach, this family friendly dining venue underwent extensive renovations and improvements to accommodate locals and visitors alike. Suntex adds Marina Jack to its portfolio of 34 Marinas in Kentucky, Florida, Georgia, Iowa, Maryland, Massachusetts, New Jersey, New York, Texas, Virginia, Tennessee, Oklahoma and St. Maarten. For more information on Marina Jack, Suntex Marina Investors LLC, or the complete portfolio of Suntex marinas, please contact info@suntex.com or visit www.suntex.com.